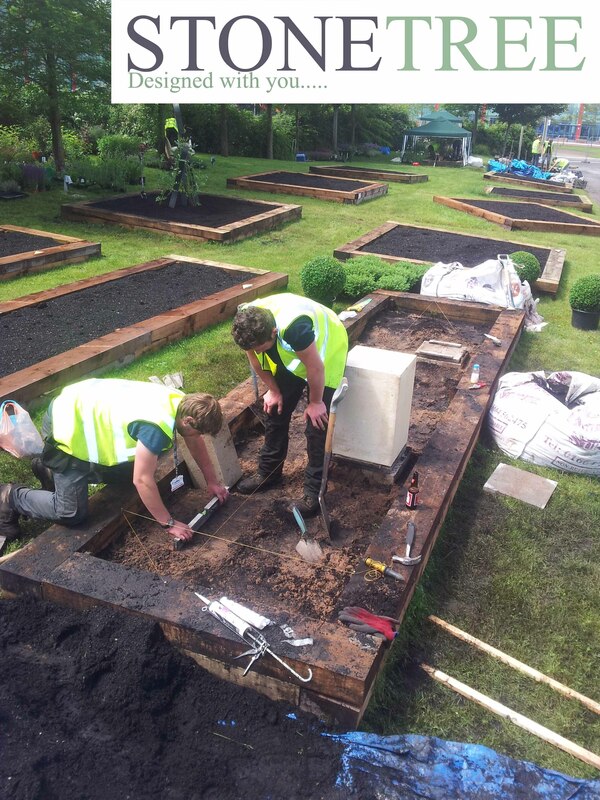 This is our live blog we had going for the run up to BBC Gardeners World Live 2014. It takes a lot of time and energy when preparing for these shows, daily watering and slug repelling for instance, and we thought you might want to read about our experience. 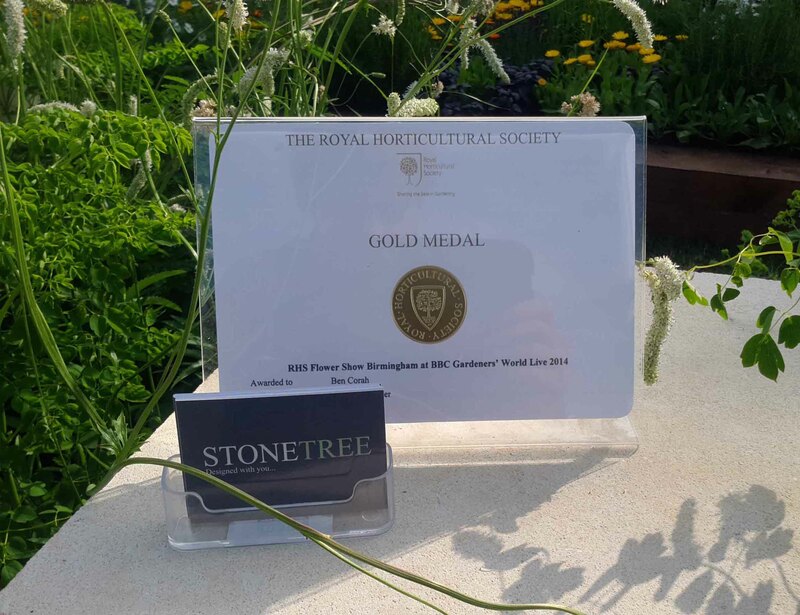 The last couple of months have been a busy time for Stonetree landscapes, it’s no coincidence that the launch date for the website falls on the same date as the opening day for BBC Gardeners World Live at the NEC in Birmingham as we are exhibiting our first show garden there. 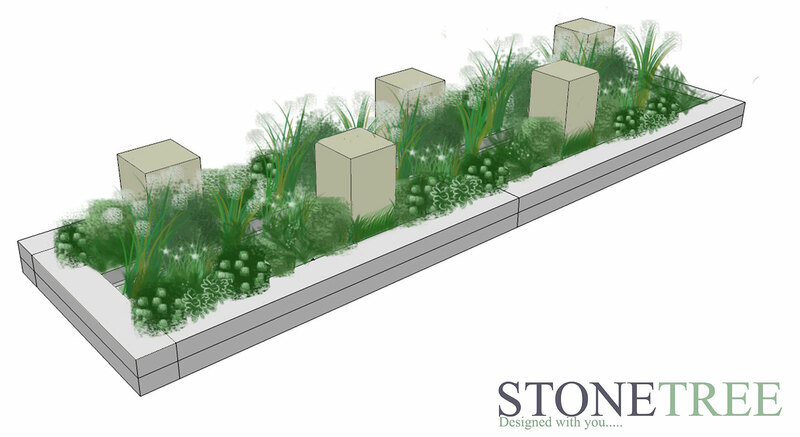 The garden is entitled ‘Urbanised’ and will be in the centre of the show for all to see, it features 5 limestone cubes set amongst thick planting with both natural and formal elements combined. 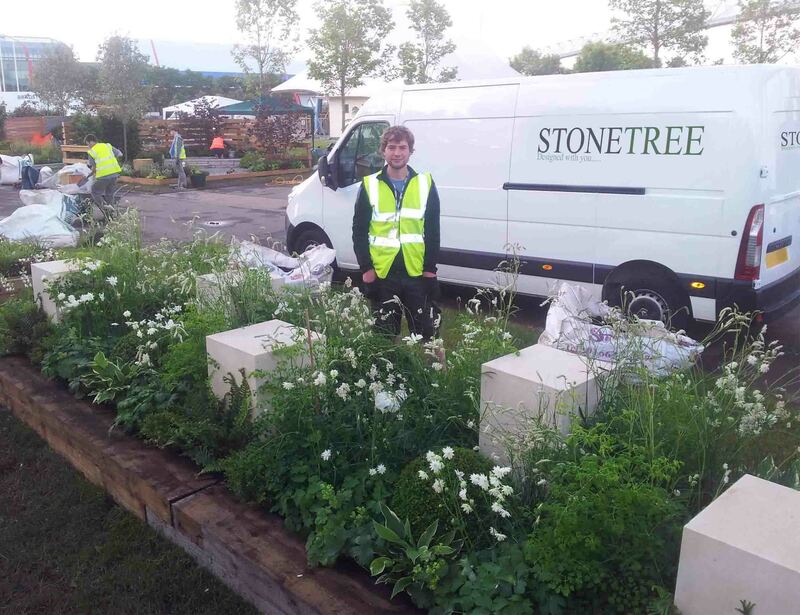 While it’s not the first for our designer Ben Corah who exhibited a garden last year at the same show it’s a first for the Stonetree team as a whole. We've had all the plants (over 350) since March so that we can nurture them to perfection ready for the show. 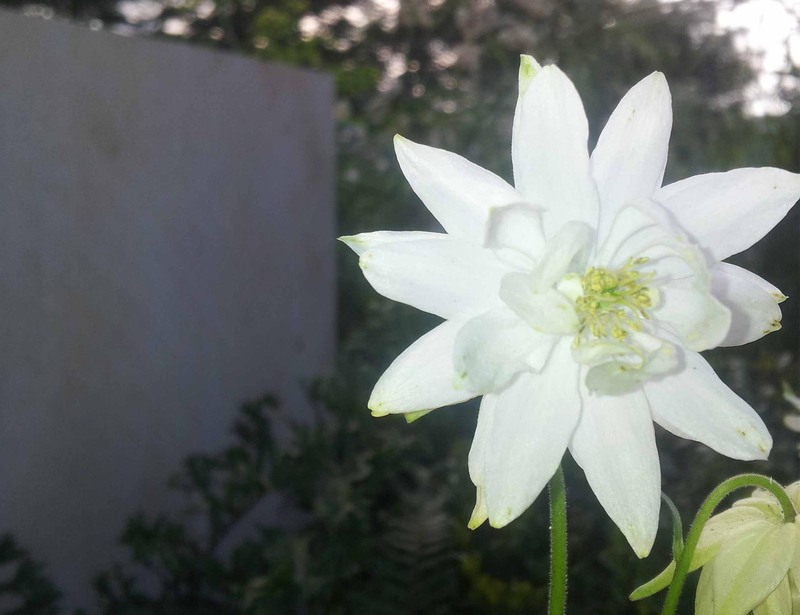 It’s been a challenge to get the timing right as we've had such a mild winter which has led to many plants wanting to flower early, coupled with the late frosts we have had and the differing weather on a weekly basis has proved to be troublesome! With only 3 weeks to go to the show is full steam ahead preparing everything and getting it looking perfect for the judges on the Wednesday morning! There’s no compromise when it comes to the RHS judges and we have even prepared a comb to get the grasses looking just right! We just hope that the slugs and snails keep of the Hostas. It’s been all systems go at Stonetree as we get closer to the show, and our hard work over the last few months is bearing fruit. Most of the plants are looking great, despite the typically variable English weather, including a late bout of frost! We’ve discarded some of the less worthy plants (or the ones the slugs managed to reach) and restocked the shortfall to ensure we have a vibrant looking display of healthy flowers. As we write this we have but a few short days until the judges make their way through the exhibitions, casting their critical eye over what’s been the labour of love for fellow landscapers and gardeners for many months now. 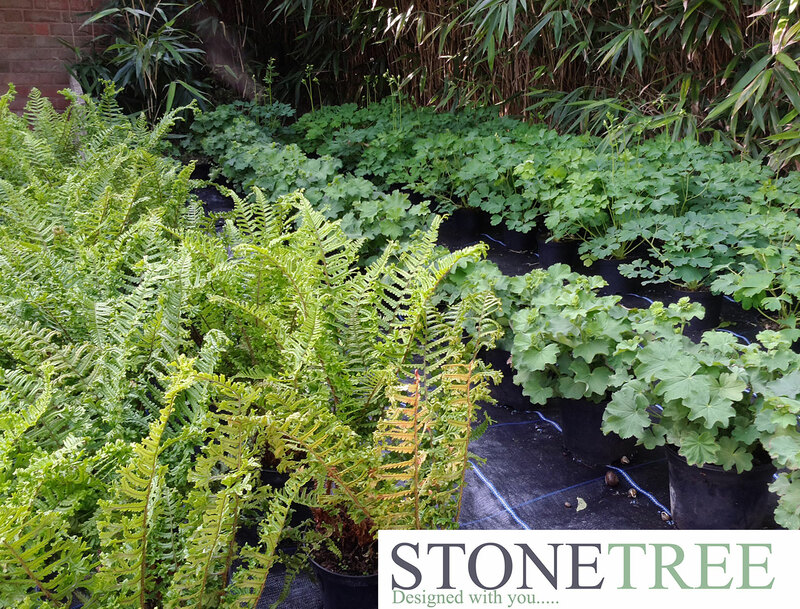 All plants have been delivered, the limestone cubes are set in place, the steel rill is bedded in and sealed, and we’re meticulously positioning our plants to provide just the right coverage against the contrasting limestone, and a draping cascade above the steel rill. We were first on site in Birmingham on Saturday 7th, bright and early and raring to get started. The van team had a 7am pickup of the limestone cubes from Stamford Stone, which meant they were able to enjoy the first glimmers of warm sun momentarily before dark clouds brought thunder and lightning and a generous dousing of heavy rain. The other team members were at the exhibition at 8am, removing the soil from the sleepers ready for the first van load. The first delivery from the van was at the NEC for 10am, with the cubes, steel rill and box plants quickly unloaded before setting off back to Melton for the next load. Whilst the van team were cruising at a steady 70 along the M69, the site team were setting the limestone cubes in place. This proved to be a tricky affair as they weigh in at a cumbersome quarter of a tonne each. 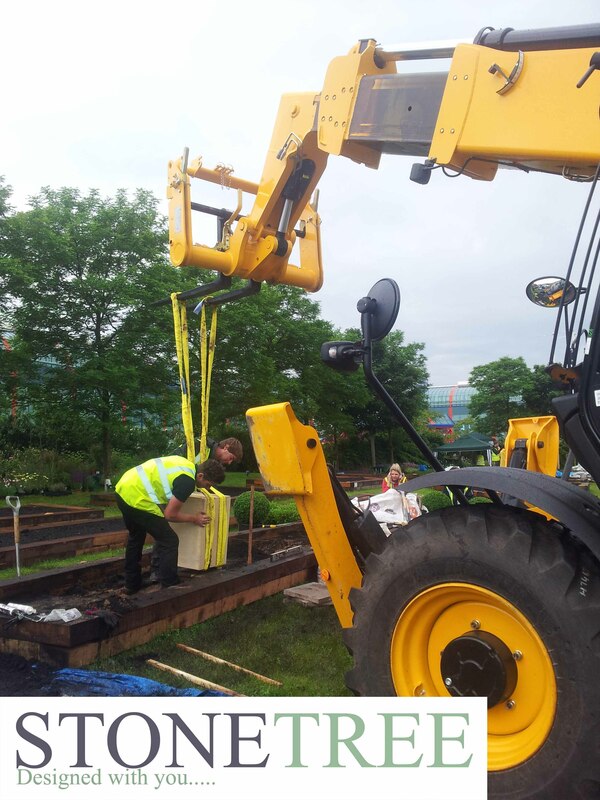 With special thanks to the forklift driver, who must be one of the most helpful forklift drivers around, we set about lifting the cubes onto a prepared bed of sand and slab. Rain interspersed the morning and the clouds looked set in for the day. 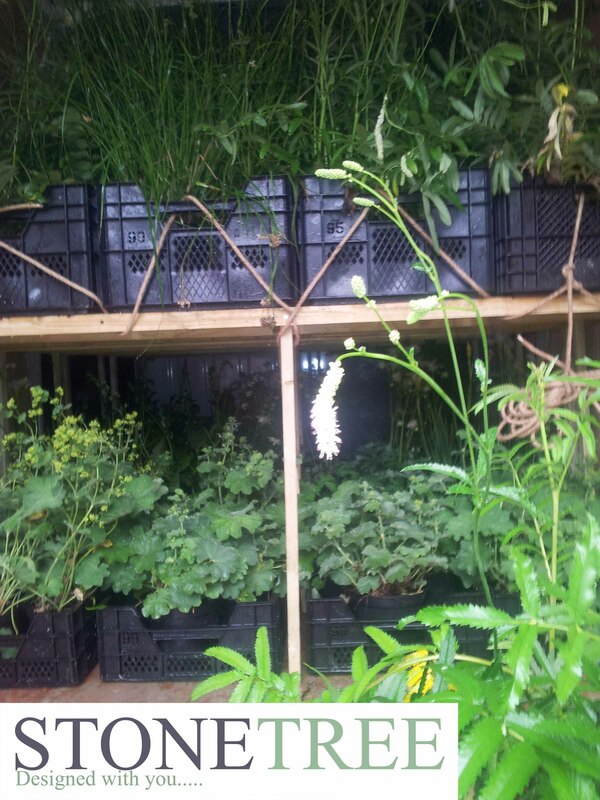 By late afternoon, the van team had made a further two trips to and from Melton to retrieve the remaining plants, leaving behind a bare yard, full of the green specks of crushed slug pellets and a lot of dead slugs. The sun was beating relentlessly and the site team had just about positioned the cubes in place by this point, after hours of painstaking tweaking. 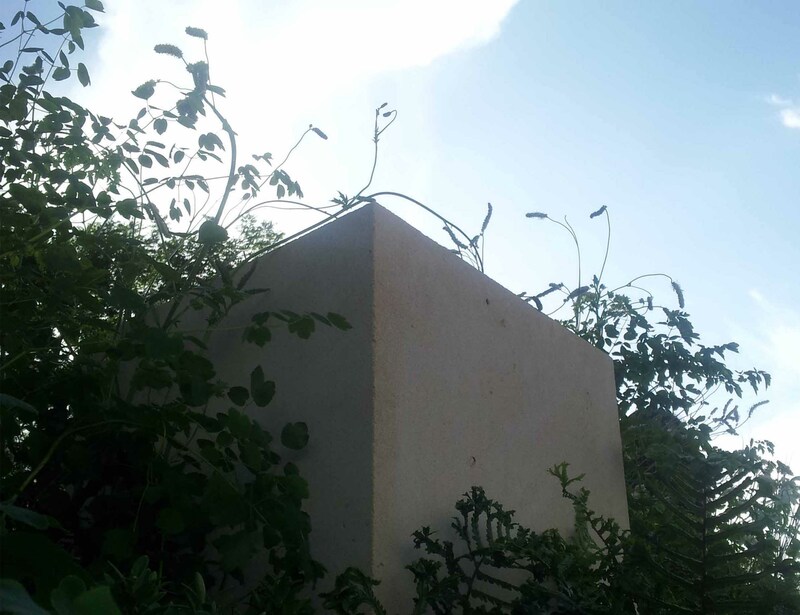 Mindful that the Limestone cubes would tower above the green planting, symmetry and accuracy between the blocks was paramount to a successful presentation. Finally, once the team were satisfied that the blocks were in the correct position, we set about laying the steel rill in place, careful not to disturb the rust on the inner faces of the rill. At 630pm, after 12 hours of hard work and 360 miles of driving, it was time to call it a day. 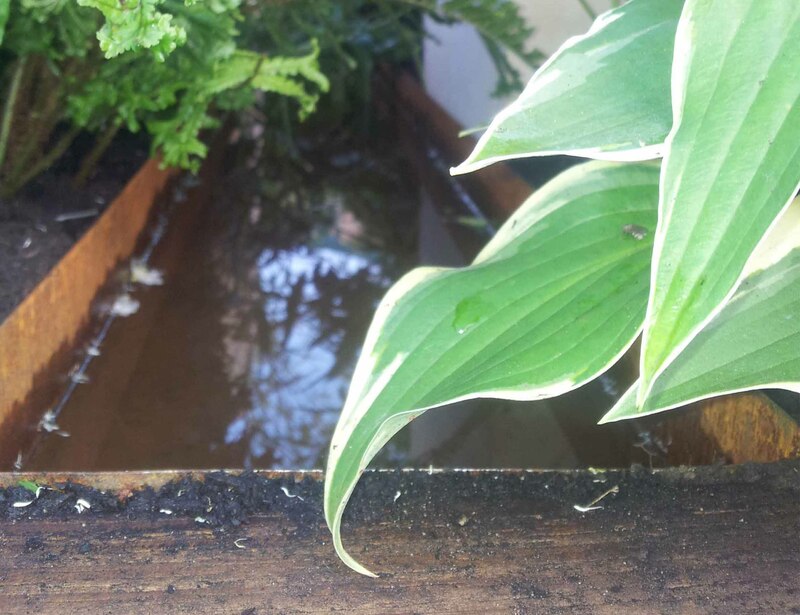 The coming days will be spent planting around the rill and cubes, drinking tea, eating biscuits and fending off hordes of slugs, the battle never ends! So after a few days setting the plants in and working against the clock, we finally manage to complete the exhibit. Some last minute pruning with some scissors on Wednesday morning was needed as we made final adjustments, made a few trims and booted the snails away. At 9am all designers were ordered to leave their gardens and step away from their areas, as the RHS judges made their inspections. The fellow garden designers all made their way en mass to get their coffee and breakfast as they waited for the judges to form their opinions. The announcements were to be made at 2pm that same day, and time seemed to slow down to, er, snails pace. Finally, the medals were handed out and Ben was awarded a shiny RHS Gold Medal, he was pretty chuffed… we were very relieved. Posted in awards, blog and tagged awards, block, garden, gardeners world live, gold medal, planter, planting, royal horticultural society.